Property 3: New, modern home with a balcony & great neighborhood - perfect for day trips! 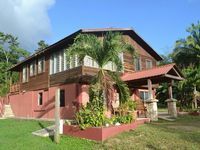 Property 6: Private, cozy, home rental -watch the howler monkeys from your deck ! Property 7: Lovely modern house w/ shared pool, gorgeous views - perfect for day trips! Property 11: Modern home with shared pool, gorgeous views and day trip opportunities! Property 13: Casa Santa Maria - Jungle River Retreat, Off-The-Grid, Seclude Get Away. Property 14: Tropical, riverfront retreat with shared pool & balcony - ideal for day trips! Property 17: Deluxe riverfront suite with shared pool, gorgeous views - ideal for day trips! Property 21: Two riverfront dog-friendly suites with shared infinity pool & balcony views! Property 24: Stunning view. Lush Tropical Paradise; Pets OK; Breezy; Creek; Rainforest. Property 25: Lovely couple's suite with a shared pool, free WiFi & riverfront location! Property 29: Awesome Jungle Garden Cottage riverside in the heart of the Maya Hills ! Property 30: Luxury Jungle Lodge with Spectacular Views.